Criminology student Angela Gough’s life is perfect; she and her lover have a house, Vince has a good job, she’s working on her thesis, they’ve talked of marriage and children . . .
. . . and then one day, Vince doesn’t come home from work . . .
. . . and a letter is left in the mailbox: Sorry, Love you, Goodbye . . .
Vince’s boss is no help, though the receptionist “accidentally” lets Angela see a contact address. It’s a posh apartment Vince couldn’t have afforded. In the bathtub there are odd things wrapped in neat packages, such as a skull with a single eye socket. In a short time, everything Angela has thought about her world will be turned upside down as she finds herself plunged into a much darker, fantastic one. From his boss, who turns out to be a crime lord named Fat Frederick Meloy, a ruthless man with the imagination of a child when it comes to the mythological, she learns Vince is a relic hunter, but not the Lara Croft kind. Vince searches for relics of the fabled and legendary, those creatures believed to be nonexistent, mere fairy tales . . . unicorn horns, fairy wings, a cyclops skull . . .
He’d done well, too, until he found an actual living nymph, discovered someone wanted her dead as a trophy, and attempted to protect her. Now Vince has disappeared to prevent the ones after him from harming Angela. What he doesn’t realize is that his pursuers may be the ones needing protection because Angela’s determined to find him. Soon she and Fat Frederick will be on their own hunt, to find Vince, and stop the other relic hunters, those wishing to destroy the few remaining creatures most humans no longer believe are real, and sell their bodies to people with money but no compassion . . .
A satyr wanting to be the last of them all, a nephelim wishing to bring about a different kind of Armageddon, a wood nymph who owes Vince her life are only a few of the creatures Angela and Fat Frederick encounter as they struggle to rescue Vince and those of the Kin, the mythological yet existing, from a society dealing in a black market like none imaginable. Author Lebbon has written a fascinating thriller in Angela’s search for Vince, that is at the same time a dark fairy tale as it reveals the existence of those creatures we learned of as children, then dismissed as unreal as adults. It’s also a suspenseful novel of what may inevitably be their fate at the hands of hunters less humane than Fat Frederick’s man. 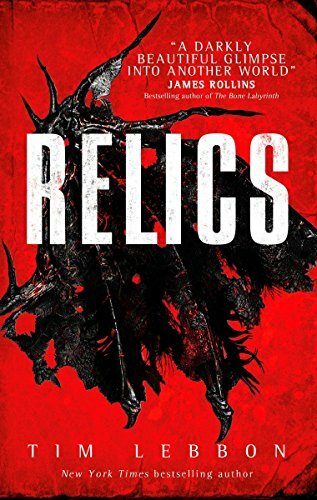 Beginning in the U.K. but crossing the Pond to finish in New York City, this first entry in a new trilogy, The Relics, promises the others should be a literary delight.